Hey there! So, Thanksgiving is five days away and I continue to obsess about all things related to table decor, menu planning, etc. I keep trying all sorts of different side dish recipes to varying degrees of success, but the one I'm going to share today is a complete winner. Incidentally, we're sitting here in Chicago looking at SIXTEEN inches of snow that just fell. In the middle of November. It's just not right! I am just not ready for winter and all its baggage -- namely, long and miserable commutes. Thankfully, this particular snowfall happened over a weekend, which makes things at least a little bit easier. Anyway, back to Thanksgiving. It has been a few years since we have hosted Thanksgiving, and I'm looking forward to having it at our house again. Last year I ended up bringing a few of my own low carb dishes to our in-laws' house just in case, but there was plenty to eat between the turkey and lots and lots of veggies. Lately I've been obsessing over roasting carrots. A bag of rainbow carrots, good olive oil, sea salt and a hot oven make for a simple and tasty side dish. Sometimes I roast a batch of carrots, particularly the pretty rainbow kind, and throw them in the refrigerator to pair with chicken or beef. They're so versatile, and the flavors can change considerably depending on the seasonings used. Sometimes I season them heavily with cumin, sometimes cinnamon, and sometimes simple salt and pepper will do. 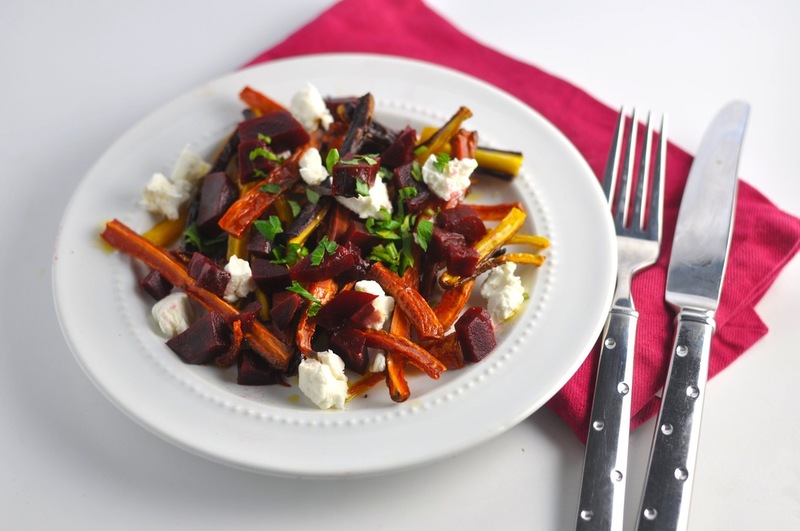 This salad takes those delish roast carrots and pairs them with beets, goat cheese and walnuts for a bright, colorful autumn dish. I'm definitely serving this one on Thursday. Happy Turkey Day to you and yours! -Wash beets to remove dirt from exterior. Slice off the green top, drizzle with 1 tbsp extra virgin olive oil and place the beets, skin on, on top of a baking sheet. -Roast beets for one hour. Remove from oven and use paring knife to easily peel the skin. Slice into ½” squares. -Peel carrots and slice into sticks, similar to the size of French fries. Place on a baking sheet and drizzle with 1 tbsp olive oil. Coat with salt and pepper. -Bake for 25 minutes, or until carrot sticks begin to brown at the edges. Remove from oven and allow to cool. -Plate carrots. Top with beets, goat cheese crumbles, walnuts and torn mint leaves. Drizzle with olive oil and fresh lemon juice. Season wlth salt and pepper to taste. Serve and enjoy! Nutritional Information Per Serving: 262.7 calories, 21.7 grams fat, 12 grams carbohydrate, 3.7 grams dietary fiber, 8.3 grams net carbohydrate, 7.8 grams protein.